Here are some professional tips on choosing a cleaning business name. Your cleaning business name gives the first impression for your cleaning service. Whatever name you choose must stick and be memorable. A slogan can help, but only if it’s short and relevant. The Glass Doctor, a local company in our town, pairs their clever slogan with their company name: We fix your panes. Don't get too hung up on having the most clever name of all time. If a good name comes naturally because of the circumstances of your surname or the name of your city, that's great. But do not labor over this process to the point of killing your enthusiasm for your new cleaning business. Funny names are not all good news. Humorous names can wear thin after awhile, or they can actually turn off some potential clients. The funny-go-lucky service professional may spend more hours at the bar than working, some may think! Just a heads up. People do think that way. Consider your business website when choosing your cleaning company name. Your website address will appear on all of your marketing materials. Use your location to your benefit. There is reason why so many businesses are named after the town they are operating in. It works! It feels official and looks legitimate. People think, hey, they have our town name, they must be town-approved. They like it here, they are going to stick around. Using your town or city's name is a good choice when creating your cleaning service name. Choosing to use your name and/or your initials paired with a descriptive word or two will increase the likelihood that the domain name will be available. Obviously, Merry Maids is not available, but Ted's Custom Clean most likely would be. This is an advantage when using both your name/ initials and a descriptive word or two. Merrymaids is definitely not available, but Ted's Custom Clean more likely is. Use godaddy.com's name search to get a list if domain name suggestions and to test what is available. You can also run your domain name through whois.com and find out the history of the domain name. It may have been used by another cleaning service in the past. It may have a good or bad search / trust history. It is best to find a domain name with no history, but that is not always possible. Be sure to check out the custom TLDs. A TLD is the prefix, for example - .com. There are also .company, .service, .cleaning, .local... there are literally hundreds of TLDs. Do not get hung up on the dot com. In fact the best TLD to have is .cleaning. It will cost much more than .com. But it will be more valuable down the road, so it is worth investing in. Learn about TLDs on the ICANN website. 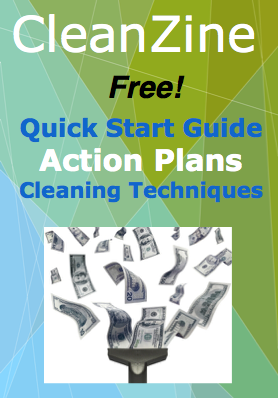 Sign up for our CleanZine and get an Action Plan on naming your cleaning business. This Action Plan will teach you best practices for naming your cleaning business. In the age of social media you will need to consider your business name very carefully and take into account some not so obvious factors. Make sure it is not offensive. Use your location in the name if you can. Try to stand out with a name that has a nice cadence when you say it out loud. Do not make your business name too long. Does your business name represent you and your style? If so, it will lend continuity to your business. Trying too hard to make up a clever name that does not fit with your style or personality will do you no good in the long term, as clients get to know you. Your cleaning service name, along with the whole ethos of your business should seem natural and coherent. Show your integrity. Our advice is to use absolutely no derogatory terms. And never use racial, religious, or sexist slurs. This should go without saying. Keep it upbeat, cheerful, and positive. Make sure the name is not taken, not copy written (trademarked) in your area or worldwide. Do an Internet search at the USPTO (U.S. Patent and Trademark Office) at www.uspto.gov. Do a local name search with Google. "TOWN NAME business name search" should do the trick. You want an official government website, not a third-party website that is trying to sell you something by serving up some statistics. Use your real name or a version of it. That will usually work best. For example, Suze & Ev's Custom Clean, or TJ's Cleaning Service. But if you ever plan to sell your business, keep that in mind. Who would buy JR's Windows? Unless they have a name like Jerry Roberts, they will not be interested. But Custom Clean Co. will work for resell, it is transferable. Write down words that come to mind and play around with them. Word play is the best way to come up with an original name. 1) Write down your initials, name, location, and ten descriptive words on pieces of paper. You may want to describe your character with words such as custom, diligent, efficient, quick, responsible, scrupulous, shine, thorough, thrifty, trustworthy. Or, describe another aspect of your cleaning service. Are you located in a busy city? Use descriptive words such as central, fast, midway, and so on. 2) Next, play with the word order. Rearrange the ten descriptive words next to your initials, name, and location. Record what comes up. Make a list. Here is a thesaurus you can use. Tip: Use keywords that will come up online when someone does a search for a cleaning service in your town or city. Put yourself in the shoes of your customers as they sit down to search for a cleaning professional. They’re looking for a fast, affordable cleaning service in [your town]. Get some feedback. Ask your friends and family to help you brainstorm a good name. You never know what creative stuff people will come up with! Conduct brainstorming sessions using email and save the email. Create a cleaning company slogan at the same time you brainstorm the name. There is definitely an art to matching a great slogan with a company name. The branding and advertising folks make lots of money coming up with these. Effective ones really make their mark. They’re hard to forget. They often employ a literary device such as rhyme, alliteration, or pun. Is it funny? Humor goes a long way to help people to relax and trust you. Is it pleasant to hear and repeat over and over again? Is it something you can stand behind? Is it you? Take your time and get the name just right, you will have to live with your cleaning business name quite possibly for the rest of your life. Have fun creating your business name and get others involved to make it more interesting. Friends & family will come up with ideas that you never would have. Here is a list of names to get your creative juices flowing. It is important to take your time when choosing your cleaning business name. Consider all of the ramifications and angles of how your name will be used and promoted before you commit to it. We hope you have found this article on picking cleaning business names useful.